If you have a family, you know that traveling and sharing experiences together is more of a treasure than anything else in life. Much like a gold coin, though, there are two sides. Wrangling the children or accommodating to your partner’s desires can be a stressful, nearly daunting task. But why should a trip or vacation be a task? Equip yourself with the proper knowledge to plan your next family vacation pleasurable and stress-free. Usually, you can save a ton of money by making reservations early. You’ll save time and stress on the trip, too. Planning the first couple days of the trip can lift a heavy weight off the entire family’s shoulders: you’ll have a place to stay and predetermined places to eat. Of course, the actual traveling is the part most parents dread. You can avoid a lot of the stress by packing travel snacks, making sure there’s sufficient entertainment for the kids (i.e. movies on a tablet or laptop), and comfortable accessories that will help keep you, your partner, and your kids well-rested for the ensuing days of fun. If you experience travel delays (layovers, delayed flights); books, work, homework, and games can be a great way to pass the time. “Do we have everything we need?” The one question asked before every departure from the house. Of course, plan accordingly. You don’t want to forget the essentials (especially the diapers, if you have little ones). Make sure the list is solid at least a week ahead of your planned trip. What would it be like to shorten this list, though? More than likely, you’ll be able to buy some cleaning supplies at your destination. Hotels and other lodgings provide guests amenities for convenience in addition to a memorable experience. In other cases, you’ll be able to rent some equipment like bikes or strollers for the youngsters. When it comes to things you CAN’T buy (or too expensive to), pack versatile options. For example, clothes can fall into this category. If you’re heading to an island or beach destination, board shorts and flip-flops are can be used at diners, downtown areas, small hikes, and (of course), beaches. When it comes to children, it can be easier to find clothes they’ll be willing to wear more than once, in turn lightening your luggage. If you pack efficiently, you may be able to pack individual bags into larger ones, reducing the number to 3 bag for 5 people. Where Does the Family Want to Go? It will help you immensely to find out what your partner and kids want out of a trip. Unlike a boss or other superior, it is not too difficult to ask your family some questions. Naturally, you won’t be able to meet your children’s high expectations. But you can make realistic plans that will give them a memorable experience. Don’t forget your own preferences, too, since the trip is meant for all to enjoy. 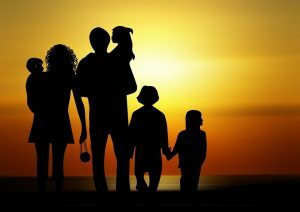 What does the Family Need? Obviously there are plenty of options in terms of property when going on vacation. To determine the best fit for your family, take a look at what each option provides. For example, when my family came to visit me on O’ahu we stayed in a quaint little cottage on the North Shore. Although not a very spacious building, it offered kayaks, surfboards, and prime proximity to a beach – perfect for myself and college-aged siblings and friends. Younger children may not want to be confined to a small room either – ample yard area may be what you’re looking for. If that’s not what you’re looking for, try vacation rental apartments: they’re more equipped for larger families. On the other hand, maybe you’d like the family to have an upscale, all-inclusive experience. Poolside amenities, entertainment, the whole nine yards. In that case, you’d be better off with a suite of some kind that offers multiple rooms, especially with a bigger family. Paying the little extra will go a long way for comfortability. Sometimes you can find great family deals, so keep an eye out. MAKE A BUDGET. The sense of security this gives you cannot be stressed enough. This applies to all trips, not just ones with younger kids. I went on a trip with my mom and brothers recently to Mexico, and the fact that we had planned on spending “X” amount of dollars made the whole experience enjoyable. We weren’t worrying about how much we had to save or spend in particular places or on particular things. Also, from personal experience, minimizing food costs by planning ahead provides HIGH savings. As I said before, you may need to accommodate your family with a larger space. If you plan this ahead, you know exactly how much you’ll be spending and can adjust accordingly. This is true for car rentals, meals out, etc. Another money saving tip – enroll in loyalty/reward programs. Mileage plans for airlines, enrollment in travel services (i.e. AAA), and shared property can greatly reduce overall expenditures. On that same Mexico trip, I didn’t have to pay a dime for my flight because we were able to use our mileage plan points. Our resort room was also highly discounted because of our rewards program. The most important part of any trip is to enjoy yourself. Although it may seem like work, planning a trip should be enjoyable as you’re seeing what kinds of memories you will make in the future. Make sure you have a great camera (or whatever your preference) to capture some of these memories. Slow down, relax, and be flexible. Children can offer so many enjoyable surprises, so go in with the proper attitude and open mind. After all, we travel to experience new places, cultures, foods, and ideas. What better way to create strong familial relationships?